Project Outcome: Multiple iterations on the Otter warmer including the latest alpha-prototype, currently being used to refine manufacturing details to bring the concept to market in 2019. Interview with Dr. Ryan Carroll, global health expert who works as a doctor in Uganda. Video (right) follows our most recent field research story and explains our approach to human factors and design research. "as designers we want to solve the problems that exist, but acknowledge and preserve what already works"
For Otter's design to reflect the philosophy of Design that Matters, it must be "hard to use wrong." That means the interface must transcend language and culture to be intuitive to hospital staff from South-East Asia to Sub-Saharan Africa. I've led two internal projects to build a functional prototype intended to be an international research tool. Each model both looks and works like the current (at the time) Otter design. We've used a variety of low-volume manufacturing equipment along with hand finishing techniques to create these prototypes. CNC milled, 3D printed and Laser Cut parts are all finished with sandpaper, Bondo and occationally, the shameful hot glue gun. These models were made in Fusion 360 and Inventor. We use one master file to export STLs and GCODE. We 3D print many housing iterations with minor adjustments to account for variation in the printing process. 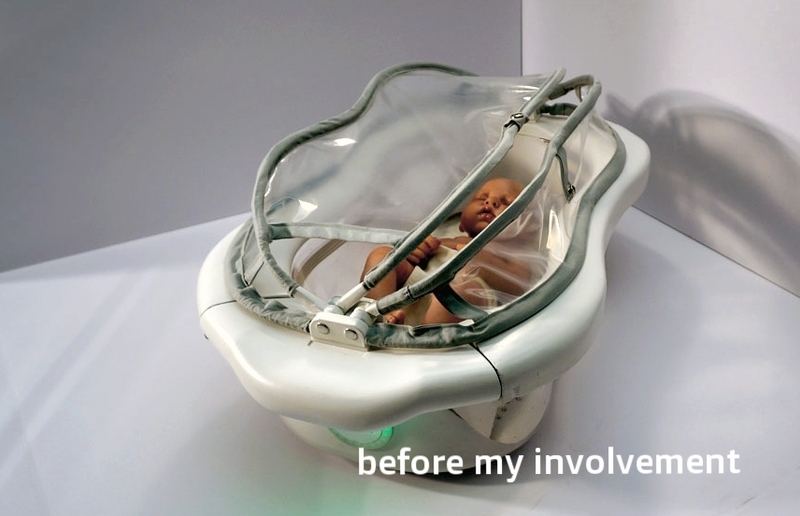 We use a vacuum-former to create the bassinet body. Sand, fill, prime, rinse and repeat. We work to simulate the look of plastic injection molded parts. Thanks to my wonderful team!